"A thick, flavorful blend of potatoes and beans! I invented this recipe with ingredients I managed to scrounge on a winter's night several years ago. It has become a cold weather staple. I always serve it with bread and plenty of hot sauce. My cat, Bela, goes nuts when I make this!" In a large saucepan over medium heat, melt the butter and stir in the flour to form a roux. Mix in the onion and garlic, and cook and stir until tender. Place the potatoes and bacon bits into the saucepan. Cook and stir until well coated with the roux. Season with celery flakes, ground dry mustard, cloves, cayenne pepper, salt, and pepper. Mix in the rice milk, water, and the liquid from the beans. Bring to a boil, reduce heat, and simmer 25 minutes, until the potatoes are tender. Increase the amount of liquid if the soup seems too thick. Mix the beans into the soup, and continue cooking about 10 minutes, until heated through. European soldier beans are a long, white heirloom bean. 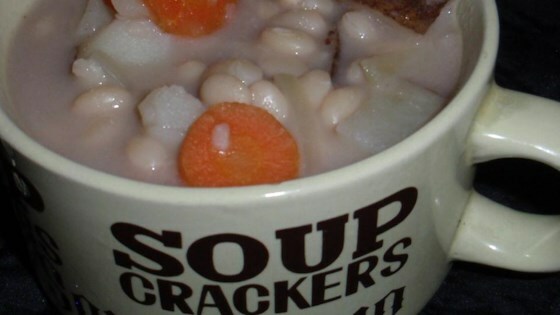 Any type of white bean may be substituted. Delicious! A real stick to your ribs chowder.